What doctors found under her shirt is unbelievable! The girl should never have survived. Virsaviya Borun-Goncharova is a 6-year-old Russian girl with large, brown eyes and beautiful, long brown hair. She has the normal hobbies of every other 6-year-old girl: painting and ballet. But while painting is no problem for her, her mother Dari worries when Virsaviya dances around. One false move and Virsavirya's life could be over forever. Virsaviya suffers from a rare disease that doesn't even allow her to attend school. The girl has something called, "Pentalogy of Cantrell." This is a disease where the heart is located outside of the chest. Patients with this disease often have other deformities with their diaphragm, abdomen wall, pericardium and/or the sternum. For Virsaviya, she is missing a piece of her sternum and has no diaphragm at all. As a result, you can see her heart beating under the thin layer of skin on her stomach. Her mother often lays her hand on her daughter's stomach just to feel her heart beat. When Virsaviya coughs you don't only see her heartbeat but also the bulging intestines under her abdomen. 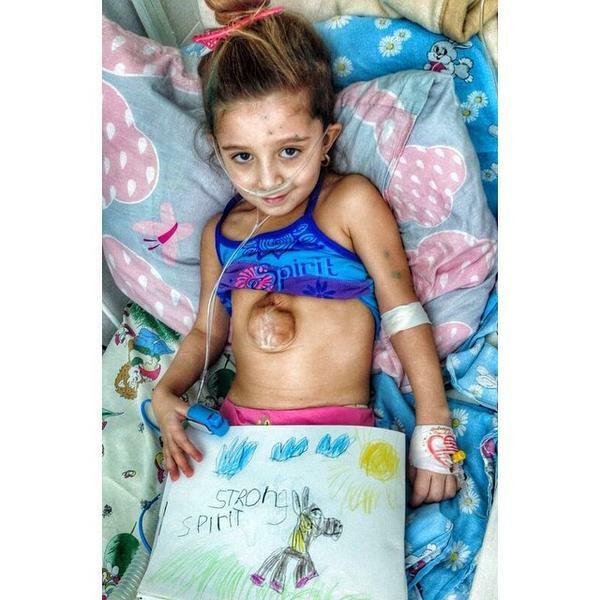 The doctors in Russia gave her no chance, but 6 years later Virsaviya is still here. She wants to live and to one day fulfil her dream to become a ballet dancer. Therefore she needs a life-saving operation, which should help her to lead a normal life. Luckily, her mother Dari found a doctor in a children's hospital in Boston, that wanted to operate on the young girl. For this reason, the two battled their way around the world from Russia to the United States to save Virsaviya's life. The brave little girl still can't be operated on, because her blood pressure is too high and the operation too expensive. People all around the world were amazed by her unbelievable story and have therefore donated over $20,000 already. The internet fundraiser is still ongoin because the cost exceeds this sum many times over. Virsaviya is still fighting because she has a lot to live for in her life. 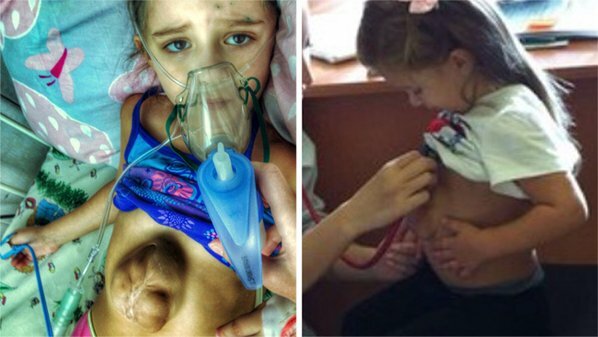 She has already survived 6 years, even though the doctors gave her no hope. Therefore. she is adamant that she will make it to through to her important operation. Her courageous story has astounded people around the world and over 32,000 people are already following Virsaviya and her mother Dari's Instagram account. If you have also been impressed by this unique little girl, then SHARE the pictures with your friends and family.